Two guests and I fished near Umitilla Reef in about 240ft of water. Lots of silvers from 60ft to the surface. Several times we had silvers hit the gear as we were setting up on the surface. Not big, but lots of them. 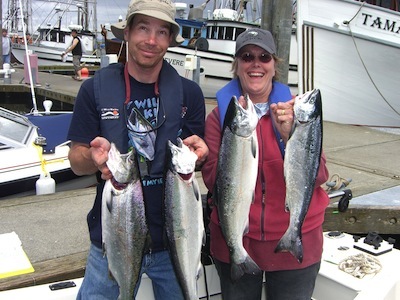 The next day with two other friends I fished straight out of Neah Bay in the straits and caught one king about 17lbs along with several silvers. Not as many fish, but not as long a run out either. Nice! Those silvers are fun to catch on the surface! Who can see this trip?